Three is my absolute favourite number in Scrapbooking! Most of my layouts are created using the ‘Visual Triangle’ principle. This means placing the elements in a triangle around the layout. I like to do this especially with my embellishments as it creates a virtual boundary for the eye, linking all the layout elements together. 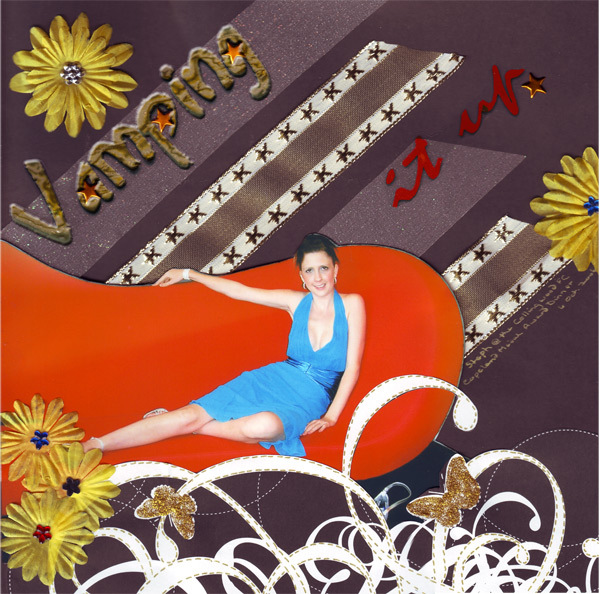 In the Vamping It Up layout you can see how by placing the Yellow flowers in a triangle around the layout it helps to visually link all the different components of the layout together. 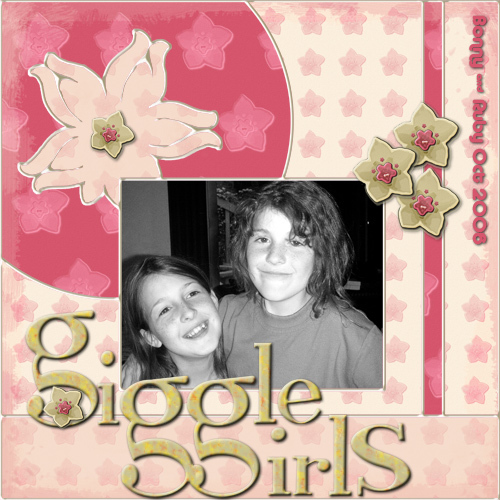 Another example is in Giggle Girls where I have created a visual triangle with the smaller flowers around the photo, rather than at the edges of the layout. Even though the triangle is not ‘around the outside’ it still has the effect of visually pulling all the element on the page together. I find this technique enormously helpful as I don’t consider I have a very strong eye for design and this approach enables me to arrange my key components on the page and then easily link them all together with three groupings of embellishments. The eye responds better to an odd number rather than an even number so I try to ensure that my embellishments are grouped in odd numbers, with three being my number of choice more often than not. And since three is the focus of this article, I need a third example to round things off. Chicks on Wheels has a visual triange composed of a row of three green brads repeated around the layout. They are incorporated into different embellishment elements but the repetition of the row is strong enough to create the visual triangle. I find this one of the easiest scrapbooking techniques you can apply to help pull a layout together and I hope you find it useful too. I am new to scrapbooking, but me and my daughter are putting one together (slowly). So I was really happy when I came across your blog. It is so helpful. Thanks! It’s very cool that you added me to your blogroll. In fact I’m flattered. Thank you. I’m glad you like my blog and that the articles are helpful to you and your daughter. 3 is a lovely number isn’t it? I wonder how many times other people use these princlples without really knowing! I hear about the visual triangle but don’t really think about it or any other “design principle” when I do my things…. sometimes it looks Ok and other times not… I wouldn’t have a clue half the time why it’s working or why it’s not!! Three is my fave too…it just adds balance! As hectic as my life usually is, balance is good. lol Over 1000 hits in one month! ROCK ON! Great tip Karen and more meaningful because you showed examples. As you say, 3 is a great number to use, but I did not think of the special effects you get by using it! The Chicks on Wheels is great! 3 is one of my favorite numbers! hahaha. Well, great layouts though. Simple yet beautiful. You can put a little more embellishments though to make it more lovely.